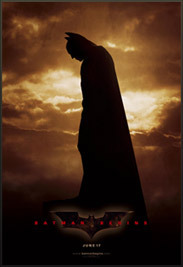 Pictured The US Batman Begins poster. 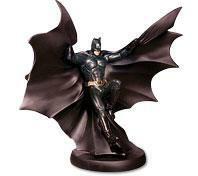 Pictured Batman Begins 13-inch Deluxe Collector Figure – a striking depiction of Christian Bale as Batman in Batman Begins. This 13-inch figure includes an authentically detailed fabric costume, an alternate set of hands, a grappling gun, Batarangs, and a stand to display the figure. 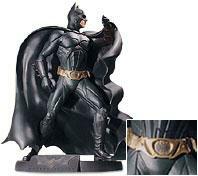 This collector figure also features a full-Color Certificate of Authenticity. Packaged in a deluxe 4-color window box. 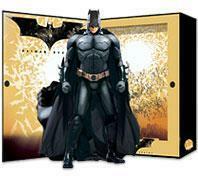 DC Direct, DC Comics’ toy and collectibles brand, unveiled its line of Batman Begins authentic movie collectibles at the 2005 American International Toy Fair. Pictured right: Batman Begins Batmobile Replica – limited edition Batmobile from Batman Begins is a magnificent recreation of the mythic automobile. This hand-painted cold-cast porcelain replica measures approximately 4.25″ high x 6.5″ wide x 10″ deep, includes a full-color Certificate of Authenticity, and is packaged in an elegant gift box with foil stamping. 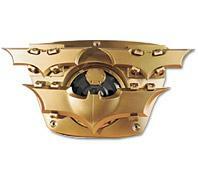 It is sculpted directly from the actual 3D designs for the Batmobile in Batman Begins. Please note this is a collectible, not a toy. Limited edition of 2600. 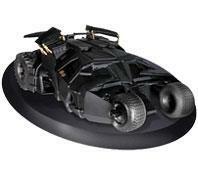 The line includes several Batman Statues, a Batman Bust, a Batman 13″ deluxe figure, Ra’s Al Ghul and Scarecrow Mini-Statues, a Batmobile Replica, and a Batarang Prop Replica. The line is being introduced throughout the Summer. Pictured right: BATMAN on Rooftop Statue from Batman Begins – Batman, Guardian of Gotham City, stands watch and is ready to leap into danger at any given moment. This limited edition, hand-painted cold-cast porcelain statue measures approximately 7″ tall x 4″ wide x 4″ deep, includes a full-color Certificate of Authenticity and is packaged in a 4-color box. Limited edition of 3500. The range costs from $30 to $300. x 5.75″ deep, includes a full-color Certificate of Authenticity and is packaged in an elegant black gift box with foil stamping. Limited edition of 1,500. 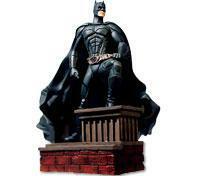 Christian Bales as Batman mini-statue, Dr. Crane/Scarecrow Mini-Statue and Ra’s Al Ghul Mini-Statue. Pictured right: BATMAN in Flight Statue from Batman Begins – Suspended in mid-air, the Caped Crusader cascades into the shadowy streets of Gotham city to unleash his vengeance against evildoers. This limited edition, hand-painted cold-cast porcelain statue measures approximately 11″ high x 8.5″ wide x 5.5″ deep, includes a full-color Certificate of Authenticity and is packaged in a 4-color box. Limited edition of 4000 pieces.